You are currently browsing the tag archive for the ‘verge gardening’ tag. There are actually tons of spaces around Marrickville LGA where vegetables could be grown. The space doesn’t even need to be big for it to be productive & add beauty to the streetscape. I found a wonderful TED video of a talk by Pam Warhurst from Todmorden England. Ms Warhurst & a group of friends decided to start a social movement, which they called, ‘Incredible Edible’ & do this bypassing bureaucracy, which they felt would hold them back. The plan was to grow food locally by planting on unused land throughout the community – so they just did it. Their motto is – “If You Eat – You’re In.” You can’t get more inclusive than this. The movement went well beyond verge gardening outside your own property. They approached businesses & local services asking to be able to garden their land that was often planted with useless & often prickly plants. The businesses said yes & so the people moved in, removed existing plants or weeds & planted the area with food. They made it look good by bringing in artistic people (not just artists) to design the area so that the streetscapes looked better. More people became involved so they involved all the local schools. They set up a Board of Management & allowed children to be decision-makers on the Board. They set up a market garden training centre. The local university/TAFE took it further by designing a local horticulture course. Suddenly, this movement was helping people to get training & jobs. The people designed the ‘Incredible Edible Route’ to take tourists through the town to all the verge gardens. They took it a step further & connected the route with all the local food producers & promoted their products. Locals started buying local & making new local products. 64 local products are now on the ‘Incredible Edible Route’ & 49% of local producers said their profit had increased as a result of this movement. That’s 49% more business than before, all from gardening the verges & other wasted spaces. The ‘Incredible Edible’ movement is spreading with more than 30 towns in England doing their own verge gardening & cities like Christchurch in New Zealand coming to learn how they can start this as part of their rebuild post-earthquakes. I find this incredibly inspiring & think it would be quite easy to do in Marrickville LGA. People are already verge gardening. 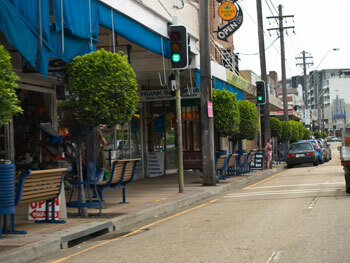 Wilga Avenue in Dulwich Hill has most of the street involved & received a major award for it. Community gardens are popping up here & there & quite a few people do spontaneous guerilla gardening to try & improve their immediate streetscape. We can’t wait for Marrickville Council to do it, nor is it in our best interest to let the vandals & thieves make it so we are left living in ugliness; not when propagating is so cheap & easy. We can all benefit from sharing plants, energy & knowledge & we will certainly benefit from better-looking, greener streetscapes. I know of one woman in her late 60s who is a guerilla gardener. She has created two beautiful spaces on public land & the whole community benefits. Visit her & she will offer food freshly picked in front of you or eggs still warm from her hen house. Spare land should be used for community gardens. I am not the only one frustrated at looking at all the Railcorp land that just sits there to be slashed or mown once a year. These areas could be transformed into community gardens or orchards. Nothing ever happens on them anyway. If in a decade’s time Railcorp does want the land to use for something, then we would just have to move on. Railcorp would benefit hugely with the positive publicity from allowing the community to use certain spaces & train travelers would have something great to look at instead of the desolation that they see out the window. Edible landscapes could be in all sorts of places, big or small. Gardeners could rove between sites or stay with the one that most interests them. Food should be shared with anyone who wants it. 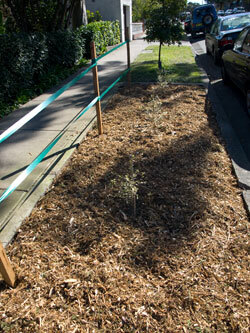 It’s working at the verge gardens of Chippendale. Sometimes someone comes & takes everything, but on the whole, produce is shared. Ms Warhurst says, edible landscapes are about “building a different & kinder future.” I believe this. I also want this. 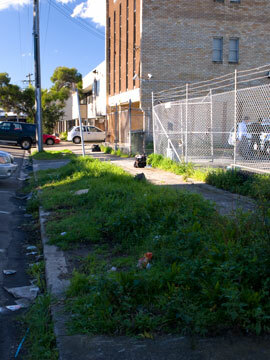 This area off Illawarra Road Marrickville is a great example of public land that is wasted. No-one uses it & Council mows the grass when needed. It could easily be transformed into a vegetable garden. Small suitable plants could also be grown at the side of the pathway as well. 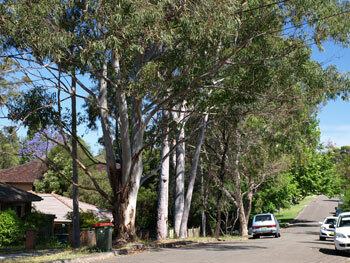 There are many places like this across the municipality just waiting to be transformed into something lovely & useful. Randwick City Council Nursery – jam packed with great plants & trees to make your garden more sustainable & wildlife friendly. Another view. Still more plants behind where I was standing. Shame it was a drizzly day. It looks much nicer when the sun is shining. I have wanted to visit the Randwick Council Nursery for ages so when I saw that they had an Open Day earlier this month we went. What a delightful surprise this place turned out to be. The verge outside the entry gate is a lesson on using natives to create a beautiful effect without needing many plants or much in the way of maintenance. 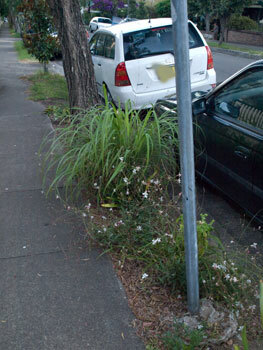 Also, the choice of plants they had on the verge was very different from what I have seen before. WIRES had a stall there, but unfortunately had left by the time I went over for a look. It was nice to see their organization supported by Randwick Council as they would have been able to speak to a lot of people about WIRES & what they do. They sell ferns, cycads, groundcovers, climbers, grasses, clumping plants, shrubs & trees that grow to over 4-metres in height. Most of the plants were indigenous to the local area – something quite important when so much of the ground is sand. 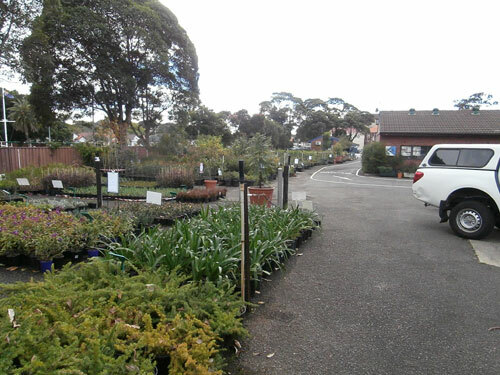 However, you will see many of the plants available growing in Marrickville LGA as well, so the nursery is useful for this region. They did have some exotics, but not many. 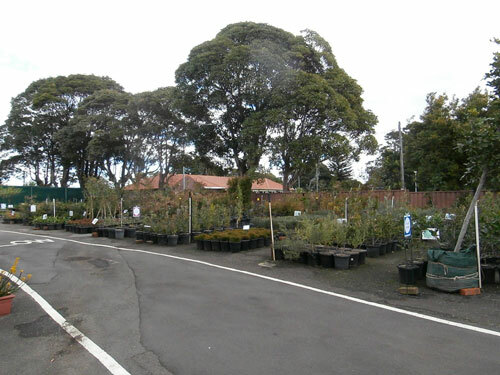 There were heaps of trees & a much wider variety than you can generally find in a commercial nursery. There were also tons of different species of plants suitable for planting verge gardens. The variety was almost overwhelming. It’s been ages since I’ve seen so many different species of native plants for sale. All plants are propagated or grown from seed onsite by the staff. They have a glass house for this process. Once established the plants are lined up in rows outside. It’s really impressive to see so many propagated plants, especially if you are like me with so many failures. The bulk of the plants are for full-sun planting, though there is a great selection of plants that need shade. The nursery staff were enormously helpful. Just tell them what kind of garden & effect you are looking for & they lead you to all the plants they think will be suitable to your needs. We even got a full lesson from one of the staff on how to propagate natives, which helped us identify three things we were doing incorrectly. None of which were mentioned in any of the videos or literature we have read on the process. 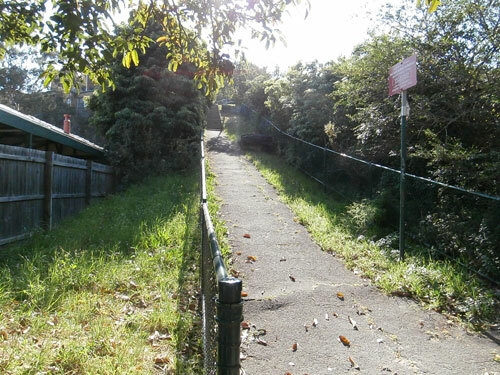 Randwick City Council’s website says that this nursery had been in operation for more than 50-years. 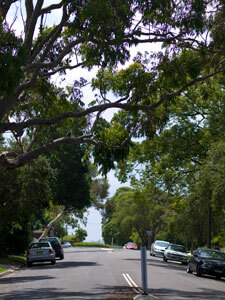 They supply plants for their own landscaping needs as well as to other Councils, organizations, landscapers & the public. 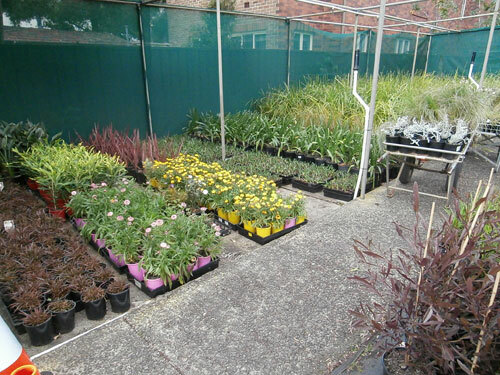 The nursery also provides workshops for the community & for schools as part of the Randwick Council Environmental & Sustainability Education Program. Outside the Office is a display shelf full of pamphlets on urban wildlife & how to attract them into your garden. This is the best selection of free reading material about plants & wildlife that I have ever come across. I had thought this nursery was only open to the public 4 times a year on the first Saturday of each new season, but discovered they are also open to the public from Monday to Friday all year, making it much easier to go there more often. If you are into native plants & you would like to buy good healthy stock at very cheap prices, this is the nursery for you. It is well worth the drive & we had no problem parking, including on the Open Day. It’s also good just to go & have a look at the wide range of native plants available. I doubt you will be disappointed. You couldn’t be at these prices. 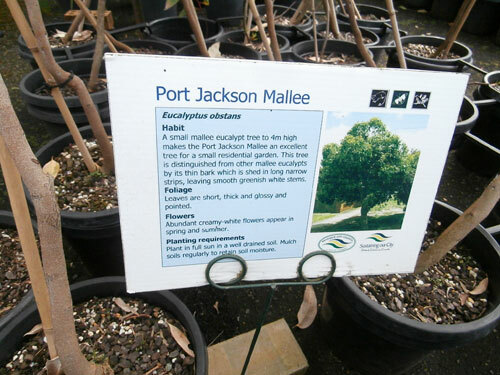 Many plants had an educational sign giving horticultural information, plus a photo of what it will look like once mature. I found this very interesting & helpful. 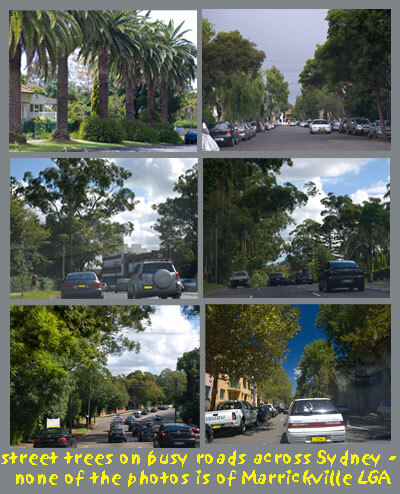 FOR THOSE ON THE MAILING LIST of Saving Our Trees – did you receive an e-mail from me regarding the street trees in Ivanhoe Street Marrickville South sent 22nd February 2010? I have been told of problems receiving this e-mail. I can only conclude that some computers are deciding e-mails from SoT are spam because the e-mail was a broadcast to a large number of recipients. Individual e-mails sent since from my gmail account have also failed.